Kayaking the Lido Mangrove Tunnels makes for some of the best kayaking around! Your kayaking adventure is found at South Lido when you smooth through the enchanted mangrove forest. Laurel Kaiser first named the “mangrove tunnels” or the exotic mangrove tunnels in 1995 — the experience is still astonishing to the first timer and a repeat thrill for those who have entered the forest many times. When choosing a kayaking tour company in Sarasota you really should choose the one that has been there from the beginning – Captain Laurel Kaiser. Sure other kayaking tour companies in Sarasota have come and gone but Laurel’s Island Style Water Sports is the original and still best tour around. Immediately, when you see the inside of the island, you’ll get it? Wow! Is the most often heard word. A photo doesn’t do the mangrove tunnel tour any justice. You simply have to see it to believe how cool it is. The mangrove tunnels were created as mosquito ditches and the eco-tour era coincided with the purchase of the mangrove tunnel area that had once been slated for development into an 18 hole golf course, condominiums and single family homes. The mangrove tunnel tour was begun as a trip from Siesta Key across New Pass, with lifelong resident and waterman, George Kaiser, who brought the very first kayaks to Sarasota in 1987, through his windsurfing shop which was located in The Village on Siesta Key. Birds were the number one draw in those days. Hundreds of birds made their homes in the mangrove tunnels before ecotourism went wild and hundreds of paddlers a day replaced the birds as the most significant user of the now extremely popular mangrove tunnels. 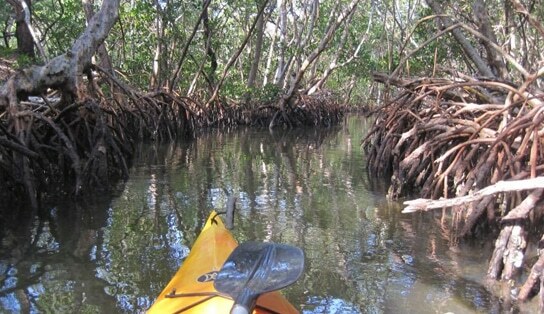 Take a kayak eco-tour today through the exotic mangrove tunnels and you’ll see a gazillion mangrove crabs that cling to the mangrove branches and trunks during periods of high tide, and then feast on the bounty of algae that covers the massive tangles of mangrove roots, exposed at each low tide. These crabs, which are the single most notable creatures seen in the mangrove tunnels today, are harmless and not afraid of the tourists or the brightly colored kayaks and paddles that they bring through their forest home. Oysters, are another amazing population that isn’t perturbed by the presence of humans in kayaks and on stand up paddle boards. The oysters are tough and hard and kayaks get the scraping when novice paddlers bounce off or get stuck in the tangle of exposed roots and branches that seem bound to en snarl the nose of the boat that isn’t quite under control. A few tips from the kayak tour guide can be really helpful in managing the tricky corners and moving tides that are part of the experience traversing the mangrove tunnels. At Ted Sperling Park, where the Mangrove Tunnels sprawl throughout the forest, it is the perfect environment for the few remaining wading birds to rest and relax in the cool quiet or diligently pursue a ready made meal. When paddlers do see the occasional Great Egret, Ibis, Night Heron or others of the rightful inhabitants of the forest, it is a must to be as quiet and unobtrusive as possible so that the bird may stay put and do what it was doing before the paddlers came along. The best kayaking in the Sarasota area is definitely a Lido key kayak tour, which we call an Adventure in Paradise, and the best opportunity for viewing of birds in the Mangrove Tunnels is in the late afternoon when the scores of people have departed and the mangrove tunnels and the forest again return to the wild creature habitat that it truly is.